I am looking at the favorites and noticed this again. He is a cutie for sure. Beautiful shot! This photo is absolutely adorable. I'm giving this a 9 for sure. I really like the fact that it's in its apparent habitat and pretty close. It is an exceptionally well taken photo too. I'm not totally sold on the framing. He might be a little better off being a little more toward the right, but regardless its one hell of a shot. discovery channel quality shot! good job! Okay, I'm totally biased now because for once, this is a picture of something other than a duck or a swan but THAT is one awesome picture. Where is this? If this is at the zoo you totally fooled me.... Great job! --10 p.s. you didn't need that ugly border. far too cute, I even like the highlights along his back from the sun..makes it seem like a very warm nap. Good job, i like the photo. great colors, sharp focus - I'm not a border fan but I love this photo. AAAAwwwwww, so cute! What a cuddle bug! The light on this little bear is awesome. Cute little fuzz ball. Great subject and setting. Good job. Now is that ever cute? I like the title a lot; not sure I like the border though. absolutely adorable coala bear and a great shot! don't have any critical remarks, 10. Oh, I love this one too. Great detail and composition! Man, this must be the cutest animal in the world. They are so cool, great attitude to the world, life and the rest. It's almost cheating, having stuff like this lying around that you can shoot! V nice work; tones, textures, composition - the whole lot. Oh this is so cute! Amazing they can sleep like that and not fall out of the tree. Great composition and detail, good job! So sharp and perfect framing. Good job! [Comment only] Oh wow, the texture depicted in this photo makes it look so real. 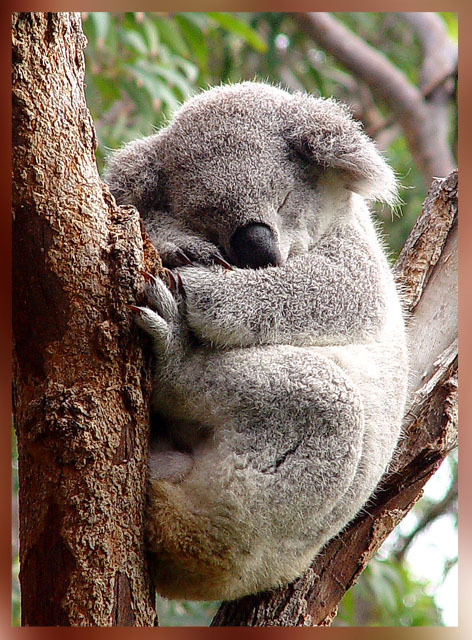 I feel as if I can reach into the image and stroke the soft cuddly looking koala. And gosh isn't it just so darn cute? Nice photo! I didn't like the border. Proudly hosted by Sargasso Networks. Current Server Time: 04/21/2019 04:08:49 AM EDT.